The researchers found little differences between virtual reality learning and hands-on or desktop learning. However, when it comes to attitudes towards the methods, differences do exist. Virtual reality is an exciting technology and has many applications in various fields of activity. In particular, many VR supporters believe that this technology can revolutionize education and training. But is it really true? A group of researchers at Cornell University wanted to check how effective virtual reality learning is. The researchers selected astronomy as the topic for the experiment. Titled “Learning Moon Phases in Virtual Reality”, it involved three equal groups of students. One group received hands-on training. The second group had to use a desktop to learn about the topic. The third group received virtual reality helmets and entered into a realistic representation of the solar system. Senior author Natasha Holmes, who holds the position of Ann S. Bowers Assistant Professor in the College of Arts and Sciences in physics at Cornell University, described the purpose of the experiment. The hands-on learning group received a source of light representing the sun as well as a short stick with a ball at one end, representing the moon. The students themselves were representing the Earth. Keeping the stick at arm’s length, the students had to spin the ball in cycles to simulate the moon phases. The desktop learning method involved a representation of the celestial bodies in our solar system. The students could change their viewpoint, switch between planar perspectives, as well as change the progression of time in order to observe the various phases of the moon. The virtual reality learning group was immersed into an interactive representation of the solar system. In this environment, they could – same as the other group – change their viewpoint, but also move forward and backward in time, and change the orbit of the moon. To make the experiment as relevant as possible, at the end of the learning session, the students received a test. Its questions were structured in a way that allowed researchers to test different kinds of learning, such as memorizing, building mental models and making predictions. The researchers compared the students’ test results and found no significant variations between the learning methods. All the students had similar performances in answering the questions. 78% of the students preferred the learning method that uses VR. At the end of the experiment, all the students had the chance to experiment the other two learning methods. And that’s when the experiment findings get interesting. What researchers noted is a significant preference for virtual reality learning. More precisely, 78% of the students preferred this method. In fact, one participant described it as “the coolest thing I’ve ever seen”. The students who did not prefer this learning method stated that they felt “uncomfortable with the overwhelming sensory input”. Others said that the the feeling like they were in the space was so exciting, that it distracted them from learning. The fact that learning outcomes, for all three groups, were similar, should not be a discouragement. 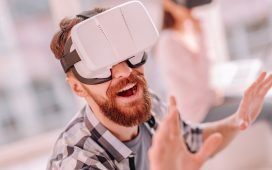 What’s important for the future of VR in education is the fact that VR is the preferred method, which means that students find it interesting, and therefore would probably find learning itself more interesting. As Madden noted, it would be exciting to see the learning outcome in situations when students are already familiar with using VR. The researchers presented the experiment at the 2018 Physics Education Research Conference. The paper is available for free at the peer reviewed Physics Education Research Conference Proceedings. In addition, the authors announced their intention to conduct another experiment. This time, the virtual reality learning group will have an avatar that will interact with the holographic universe. In the completed experiment, they noted that the lack of a holographic body was confusing to many VR learning students. The virtual learning experiment benefited from the expertise of the Virtual Embodiment Lab, a technology focused department of Cornell University. The experiment itself took place in the Mann Library of the lab. Other key supporters for the VR learning experiment were the Department of Physics at Cornell University and Oculus Education.